I see art in everything, and it has always been a matter of perspective. I truly think that we all live in one huge inconceivable artwork. What I mean by that, is if we give it a time to think -it’s not too far to find out that even the smallest grain of sand put under a microscope looks pretty amazing. Of course, everyone knows that, but often it gets forgotten. All the creative people have been trying to show it in their own ways. For masters of art, it has always been a challenge to build something stunningly beautiful, just to give a small sip of their vision to the public. The artwork is real, when it makes a difference in peoples lives. How do you make a diference? As I mentioned, I see the world as an artwork and find it important to emphasize that. I have the certain method in my approach to art that reminds me about it. I mostly tend to make my artwork appealing at the first sight. If the viewer’s eye is heeded by the view in the first place and then finds out the story of the artwork, there’s some true magic that can happen. That’s the reason why in order to see my work completely, I usually place some hidden idea in a special way to approach it. Yes, it’s unexplainable, but I like to see someone’s mood uplifted. I find it magical. Can you give us an example of such work? Certainly, I could say the latest are the greatest. 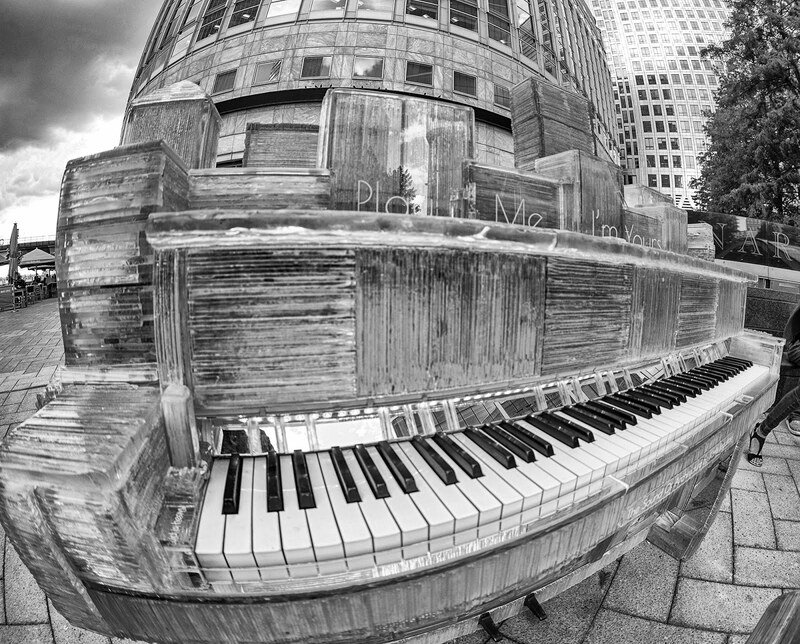 My most impressive artwork is „The Sound of Architecture” it is a real piano, all covered in thousands of layers of glass. I built a city around the piano, cutting each layer by hand, then gluing them all together with a special UV glue. The idea was to build something transparent, airy and rooted in the same time. In such a way, that it tells the story about how light things can get, when they’re approached differently. For this case, it was the architecture, „The Sound of Architecture” means that architecture is like music, each building is like a tone of sound, it holds a strong contribution in the song, whether we look at the way it’s being built with all the drawings, models, plans, maps, rules, timetables.. People – Archintects, investors, builders, their teamwork, efforts and determination to finish. Or, if we look at the function it fulfills, as the people go in an out, up and down, what sounds they make or situations they experience. The lights in the windows, reflections of the sun in the daytime or the electric light in the night. This would be one small part of what’s obvious in one building. 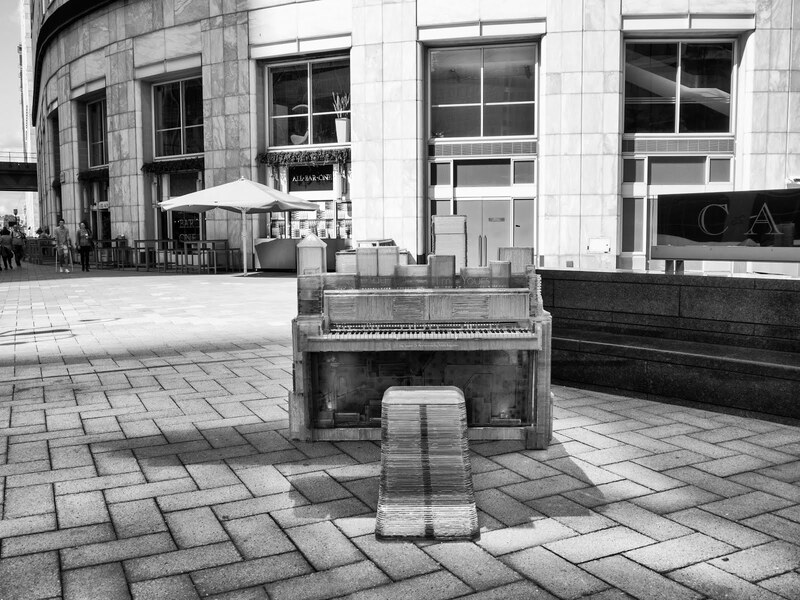 A city consists of many buildings and the growth of it could be led by one big spirit that plays the notes on the piano of improvement. And each note in our life could ding for more years or decades, just because the spirit is composing in the different time-space. And the determined people can hear the melody. It was one remarkable challenge, I had to quit my job and work for more than 4 months in order to finish it on time. 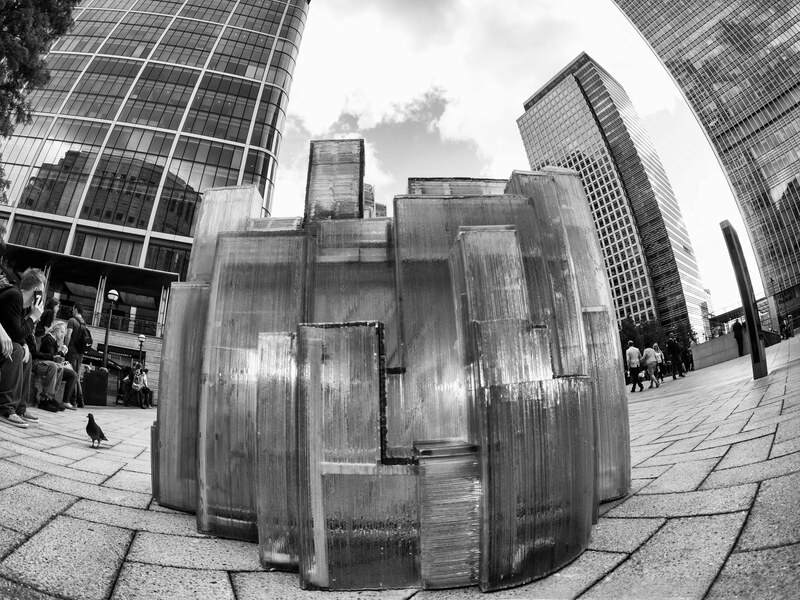 In London, Canary Wharf, on the installation day it all became worth it, I wasn’t finished with the exhibiting before I saw how people reacted to it. They were truly amazed, I haven’t seen anything that would pull people together that much, they all were surprised that it actually was a piano. 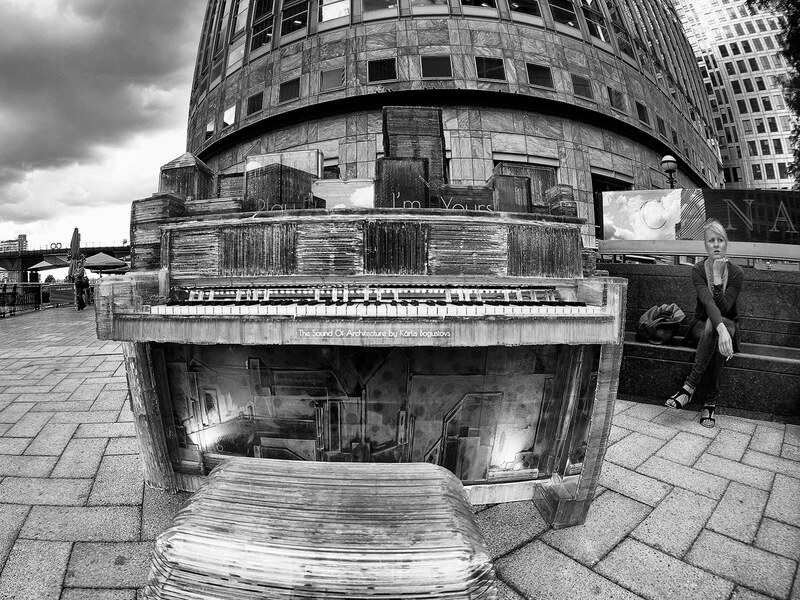 A few days later some drunks vandalised it pretty bad and it got rain in it, soaked the keys and the piano was gone, people were badly shocked, it was beautiful in some way. Fortunately, it found a new home in a building next to the Reuters plaza – Canada One Place, where I managed to mend it and the people from the building liked it so much that they wanted to keep it there for a longer time. Now is the time when I need to find a new home for my glass piano. That’s why I’m planing to sell or exhibit it somewhere else. The piano is in good condition and I’m planing to refurbish it before giving it to the possible new owner. I have placed it on Ebay, for auction and I’m open to other suggestions, contact me and let me know what you think! What an intersing story, do you have any plans for the future related with art? Yes, absolutely, I’m studying at Art Academy of Latvia right now and my plans are mostly about creating new, innovative artwork. Developing the previous and going for something totally different than before. I have plans to make an exhibition in Latvia and to do some public artwork here as well. I’m looking for collaboration with other artists, so in case if anyone is interested or has an idea, just look me up!